It all started when I wanted to join ballet, so my owner took me to the S.F.B.W. (the School For Beautiful Wocky's). I went and I tried out but the owner of the ballet school would not let me join because I was not white. I really had a passion for ballet and I tried very, very hard but I still would not be accpeted in this ballet school unless I was painted white. But when we got there and I had tried out, the owner of the school would still not let me join, this time he said that I was FAT! The owner was right, I was a little chubby and I wasn't as skinny as all the other wocky's at that ballet school but it really hurt me that he said I was fat! So I went on a diet, but that didn't work. :( I mean, who can go on a diet in neopia when there are so many great chefs and so much great food??? I never got accepted in the S.F.B.W.. I could follow my dream of being a ballerina. 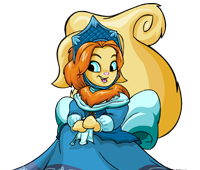 I went out to the market and I bought a pair of ballet slippers and then I went home and my owner and I worked all day cleaning out our basement, then the next day I opened my own ballet school, for neopets of all shapes, sizs, and colours. I had a dream to become a ballerina, so I became a ballerina. If you have a dream, maybe to be a hockey player or a famous artist, don't give up! Life has its ups AND downs and you should always make sure that your ups, out number the downs! FOLLOW YOUR DREAMS AND YOU WILL BE A WINNER!! !